A runaway train thriller, Unstoppable is visually appealing but has an extraordinarily limited premise. 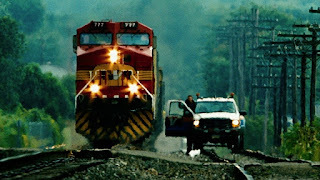 At a Pennsylvania rail yard, a sloppy worker jumps out of slow moving train AWR 777 to throw a track switch. The train kicks into gear, and with the air brakes unattached, accelerates and leaves the yard unattended. The runaway train is half a mile long with four of the cars carrying dangerous cargo that could ignite on impact. Train yardmaster Connie Hooper (Rosario Dawson) swings into action to clear the track ahead of the runaway. Her boss Oscar Galvin (Kevin Dunn) tries to take charge, but makes all the wrong calls. In the meantime veteran railroad engineer Frank Barnes (Denzel Washington) is winding down his career and spending the day training rookie conductor Will Colson (Chris Pine). Barnes lost his wife to cancer and has a strained relationship with his two daughters. Colson is in trouble with his wife, who has issued a restraining order. In their own freight train 1206, Barnes and Colson barely avoid the runaway. They take off after it in reverse, hoping to catch it, couple to it and slow it down before it derails at a dangerous curve in an urban area. The last film directed by Tony Scott, Unstoppable is inspired by an actual, if much less dramatic, runaway train event that occurred in Ohio in 2001. The film contains no shortage of astounding cinematography capturing the raw kinetic energy of an out-of-control red beast on rails, cutting a swath through the countryside. And of course this being a Tony Scott film, a news helicopter or three always clatter away, inches from the train, just to add flair, drama and fury to the sound and visuals. Unfortunately, Unstoppable offers precious little else beyond the obvious feast for the eyes. "Two men stop a train" is about as far as as the plot goes, and milking a 98 movie out of that flimsy premise proves to be as challenging as it sounds. Attempts to flesh out family stories for Frank and Will come across as contrived in the extreme, as does the awkward portrayal of dufus and incompetent managers back at the train company's headquarters. And while it is difficult to keep count, Unstoppable likely violates all the laws of physics before the drama comes to a smokey halt. Denzel Washington and Chris Pine are workmanlike but constrained by the material, although the evolving level of respect between the two men within the train cab's confines maintains marginal interest. Rosario Dawson tries to inject some energy into proceedings back at the yard. Unstoppable whizzes by, great visuals on rails, everything else an inconsequential blur.